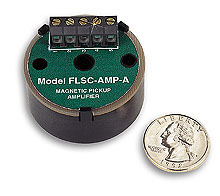 OMEGA’s Model FLSC-AMP-A amplifies the low level sine wave signals from a magnetic pickup sensor to a high level square wave output directly proportional in amplitude to the power supply voltage powering the module. This amplified signal will drive any ratemeter, totalizer, counter, or batch controller. 참고: Compatible with paddle wheel sensors and turbine meters. Examples: FP-5300,FTB-100, FTB-900 connected to FLSC-AMP-A to DPF70 series panel meters.